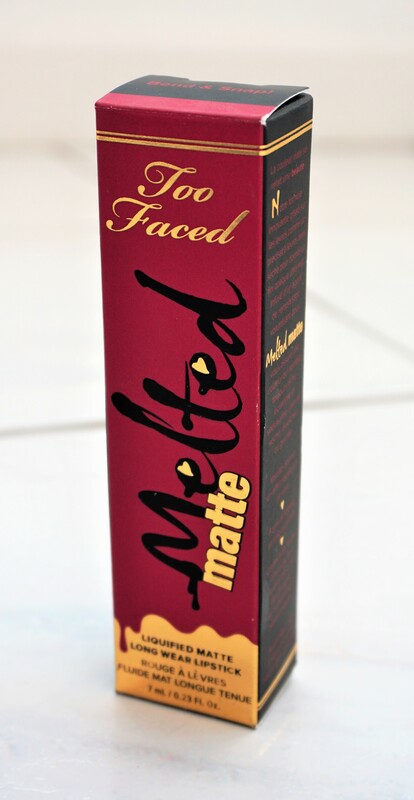 The Too Faced Melted Matte Liquified Matte Long Wear Lipsticks come packaged in a long, rectangular box. The box is coloured in the shade of the lipstick encased inside, with black and gold writing. The front of the box gives the brand name, product name and product volume (7ml / 0.23fl.oz). The top of the box gives the shade name, which is written in the colour of the product inside. 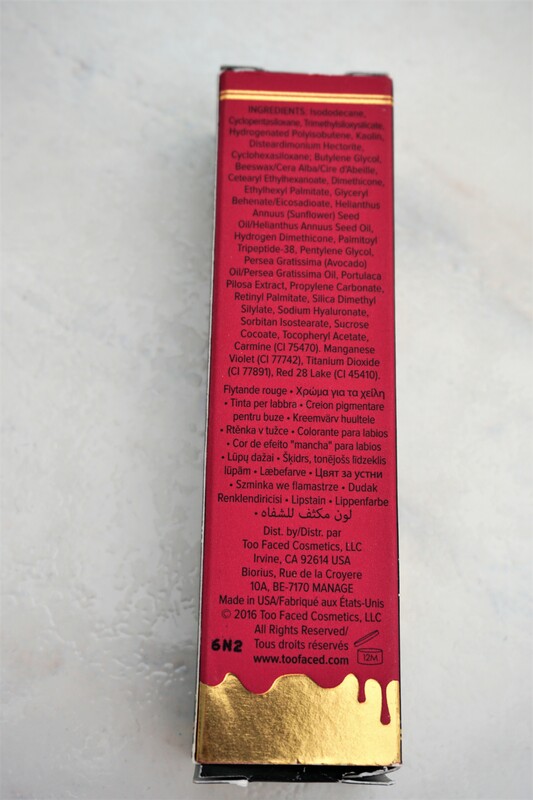 The back of the box provides the ingredients for the lipstick. The side of the box has information on the lipstick formula, ingredient features and the applicator. The box states that the formula “…glides over lips like a gloss but dries to an ultra-matte opaque finish”. The formula is meant to be lightweight and long-wearing, as well as “Infused with a no-sting plumping filler”. The colour is touted as looking “…rich, full and kissable – never dry, shriveled or cracked”. The lipstick is meant to contain “…avocado oil, vitamin E and hyaluronic filling spheres. The box also advertises that the applicator is angled, allowing for precise application. The lipstick comes in a sturdy, yet still lightweight, clear plastic tube. The bottom half of the tube contains the product and has sides which fan out into an A line shape. The tube shape is well thought out, as it stands up steadily when you place it upright. The tube provides the brand name, product name. The lid is coloured in gold with the Too Faced emblem inscribed on top. The back of the tube has a small, clear sticker with the shade name and product volume. The wand for the lipstick is long, with an angled, firm, hoof shaped applicator. I really like the applicator, as I find that it picks up just the right amount of product – not too much and not too little. The applicator design enables you to apply the colour evenly and precisely to the lips. The flat part of the applicator can be used to spread the lipstick easily and evenly over the lips for a good coat of colour. The angle of the applicator enables you to apply the lipstick precisely to the corners of your mouth, without having excess product slipping around. I loooove the texture of this lipstick! I agree with the product claims on the box, as the lipstick feels so lightweight and velvety on my lips. The formula glides on so smoothly and evenly, allowing you to quickly get an even and opaque application of colour. The lipstick does dry down to a comfortable, matte finish. I don’t find it to be drying but I do like to apply a little balm over the top to give my lips a little more ‘give’. I also like using a balm over the top as matte lipsticks can show up lip lines on me and I like them to look fully smooth. It’s worth trying out the lipstick with and without a balm on top to see how your lips react to a matte formula. I find that the lipstick does make my lips look fuller somehow and without any stinging. I’m not sure if it is the colour, the application wand or the formula but I love how full my lips look when I apply this lipstick. The colour payoff of this lipstick is fantastic! I tried on a few before I selected the shade I purchased and found them to be incredibly pigmented, full coverage and opaque on the lips. The colour generally stays on strongly and lasts well across the day. I find it wears down ever so slightly when I eat or drink but it does so evenly and without any patchiness. I sometimes top my lipstick up after eating or drinking but it’s only really to freshen things up a little. I picked up the shade ‘Bend and Snap’, which is a beautifully rich, deep berry tone. I love wearing this lipstick for a vibrant, statement lip on days when I don’t feel like wearing any other make-up. I also love wearing it alongside neutral, gold, grey and pink, purple eyeshadow combinations for a strong lip look. 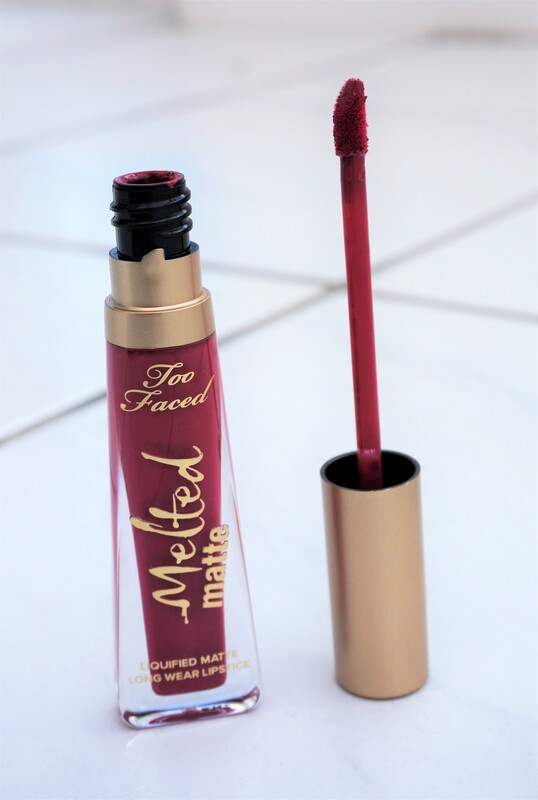 Too Faced Melted Matte Liquified Matte Long Wear Lipstick costs £19 and is available in the UK from Debenhams, Cult Beauty and Selfridges. There seem to be 23 shades available on the Too Faced webpage and only 16 shades available on UK stockists, so you may find some variability in shade choice depending on where you purchase this product. 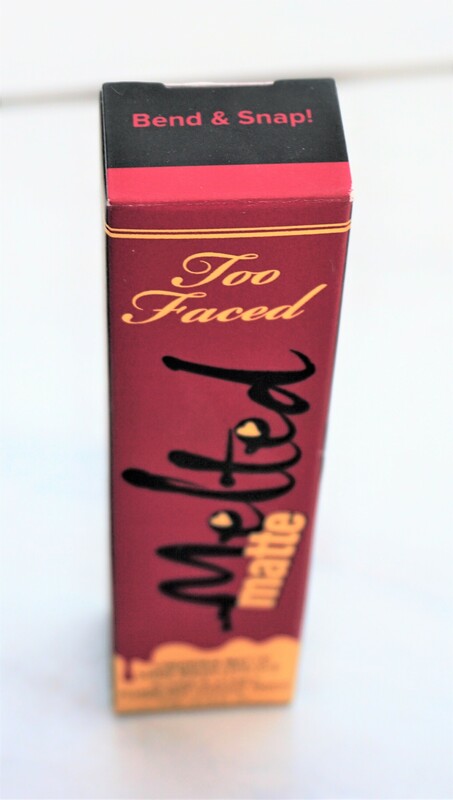 Have you tried any of the Too Faced Melted Matte Lipsticks? What shades have you tried and what do you think of them? Any other products that you love from Too Faced? Let me know in the comments section below.